Within the coarsening base of an ancient mudstone exposure in the Afar Region of Ethiopia, researchers say they found evidence that provides new information about the best-known early human ancestor, Australopithecus afarensis. Yohannes Haile-Selassie--curator and head of physical anthropology at the Cleveland Museum of Natural History--and an international team of scientists dug up a 3.6 million-year-old partial skeleton of the same species as the famed hominid "Lucy." It's only the second partial skeleton of A. afarensis to be recovered; it's 400,000 years older than Lucy and it's male. But just as important, the fossil remains provide conclusive proof that A. afarensis could walk upright freely without the use of its hands. "The KSD skeleton is long sought fossil evidence," said Haile-Selassie. [KSD is shorthand for 'Korsi Dora,' the name of the locality where the skeleton was found.] "It complements the Laetoli footprints and incontrovertibly shows A. afarensis was an obligate bipedal since its first appearance in the fossil record." The new skeleton's scientific designation is KSD-VP-1/1. 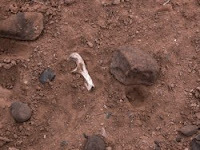 Researchers recovered the skeleton as part of the paleontology-focused Woranso-Mille Project that has been ongoing in the region since 2004. The researchers report the finding in this week's Proceedings of the National Academy of Sciences early online publication. The National Science Foundation is a major funder of the work. Previous examinations of Lucy, who lived 3.2 million years ago, led some scientists to conclude A. afarensis was not fully adapted to upright walking. The newly recovered fossil, nicknamed "Kadanuumuu" and pronounced "kah-DAH-noo-moo," clears up the debate. "Kadanuumuu" appears to be in good agreement with fossilized footprints dated to about 3.6 million years ago and discovered in Laetoli, a site in Tanzania in eastern Africa. The footprints show that early human ancestors habitually walked upright; there are no knuckle-impressions or signs of abducted toes. The misinterpretation concerning Lucy's ability to walk upright resulted largely from her small frame, said Haile-Selassie referring to her estimated 3 1⁄2 feet. But "Kadanuumuu," whose name means "big man" in the Afar language, is 5 to 5 1/2 feet tall and the proportion of the length of his legs to his arms compares favorably to modern humans. Long legs are a tell-tale human characteristic of bipedalism. "Generally speaking, the skeleton clearly shows that the emergence of advanced bipedality is not associated with the first appearance of our genus Homo," said Haile-Selassie. "But rather it has deep roots going back to more than 3.6 million years ago." "Kadanuumuu" also has most of the same skeletal parts as Lucy and others never previously known, including a significant portion of the rib cage and a nearly complete adult shoulder blade. "'Kadanuumuu's' shoulder was also a major discovery," said Haile-Selassie. "It shows that our ancestor's shoulder blade and rib cage were much more similar to those of modern humans than previously had been thought." Before now anthropologists concluded evolutionary ancestors had shoulders more like those of chimpanzees. But "Kadanuumuu" surprised researchers by revealing a shoulder very different from chimpanzees, which are thought to be the closest living relatives of Homo sapiens. "This tells us that chimpanzees have evolved a great deal since we shared a last common ancestor with them," said Haile-Selassie. Renowned Ethiopian fossil hunter Alemayehu Asfaw found the first element of "Kadanuumuu" in February 2005 at Korsi Dora, about 210 air miles northeast of the Ethiopian capital Addis Ababa. The specimen was exposed on the surface and further investigation resulted in the recovery of more elements. Excavations between 2005 and 2008 uncovered an upper arm, a collarbone, neck bones, ribs, pelvis, sacrum, a thighbone, a shinbone and the shoulder blade. Excavations took more than five years to complete. Publication of more results will continue as researchers complete more detailed analysis of Kadanuumuu. Scientists from Case Western Reserve University, Ohio; Berkeley Geochronology Center, Calif.; Addis Ababa University, Ethiopia; and Kent State University, Ohio contributed to this research.